The Faculty Senate (FS) operates according to principles of shared governance and serves as the main channel of communication between the faculty and administration of USF St. Petersburg. The Faculty Senate's most important function is to serve as the primary academic advisory body to the Regional Chancellor and Regional Vice-Chancellor for Academic Affairs. The responsibility of the Senate is to make recommendations pertaining to the operations and welfare of the University, particularly those pertaining to the academic mission of the University, but members may discuss and take a position on any matter of concern to the campus community. Members approved a motion to rename this body the "Faculty Senate" at the 16 November 2005 meeting. Prior to that time, this body was known as the Campus Faculty Council (CFC) or Faculty Council (FC). 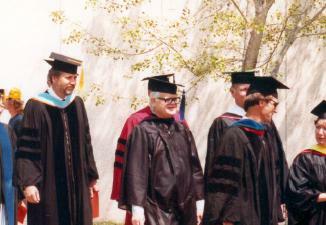 Documents created by the Faculty Senate prior to 2006 will refer to the CFC or FC rather than FS.